The lotus flower, also known as water lily, as mentioned in previous posts (such as traditional: water lily/ lotus flower and lotus flowers (: more recently) is associated with new beginnings, and, in India, with the god Ganesh which is, also, the god of new beginnings. It’s also associated with purity as it grows in muddy and unclean waters and it’s always clean and beautiful. The japanese for it is 蓮の花・はすのはな meaning lotus flower (I’ve also found references to 蓮華・れんげ with the meaning of lotus flower!) and also 睡蓮・すいれん as water lily and both are used when naming diagrams. If this is the first lotus flower you make you might want to try the simpler one, with two layers of petals as shown on the diagram, and on the picture above. After that, you can add one or even two layers of petals to the lotus flower. In this diagram some steps have explanation lines to make it somehow clearer; they are in portuguese and english and are very brief. I also included hands for you to know how to position your hands. A real step by step diagram this time around! Perhaps too much? 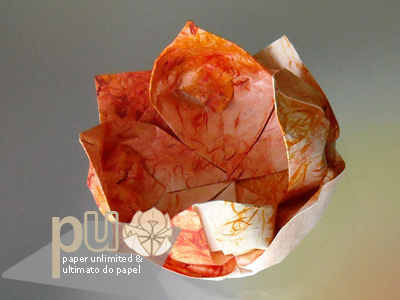 Take great care when you pull the petals as the paper might tear! If it does, keep going; do another one, or how many it takes for you to understand how much pressure you should use and how to hold the paper for it not to tear. Good luck! In this diagram if you use a big or thin paper you can repeat step 2 and do three layers of petals instead of two. 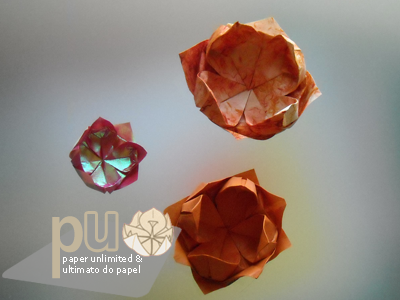 Or, if the paper is big and thin, and perhaps with a bit of wet folding, you can even add a fourth layer of petals. In the picture above the orange lotus flower has three layers of petals and the other two, two layers each. This entry was posted on 2010|11|27 at 09:54 and is filed under diagrams, origami. You can follow any responses to this entry through the RSS 2.0 feed. You can leave a response, or trackback from your own site.